It’s time to get your gaming and party spirit on again as Rugby Rumble kicks off this September. A thrilling and fun seven-a-side Tag Rugby Tournament that brings former college rugby stars to the pitch yet again, Rugby Rumble will combine the excitement of the great sport, with a carnival-like atmosphere that is topped off with a night of sensational entertainment. 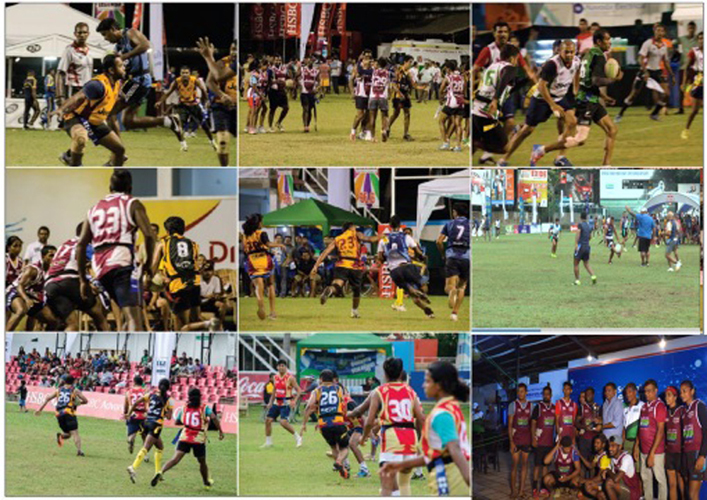 Organized by Agoal Rugby and held for the fifth consecutive year, the carnival will take place on September 8, 2018 from 8.30am onwards at the Havelock Sports Club grounds. “This year Rugby Rumble will be back with a record number of 33 teams in 2 different age groups. We are making arrangements to cater to the entire family where for the first time we will be introducing a kids rugby competition where the future Tuskers could perform in front of big crowds,” said Dilroy Fernando, Tournament Director of Rugby Rumble. Rugby Rumble will consist of several teams vying for trophies and prize money of Rs 300,000/-. Old Boys from leading rugby playing schools, namely Kingswood, Zahira, Lumbini, Royal, S. Thomas’, St. Joseph’s, Dharmaraja, Isipathana, Wesley, St. Benedict’s, Vidyartha, Lumbini, and Science College are participating. The teams will comprise of members from different eras, while two female players will also be included to add some spice to the scrum. Two mixed school teams and one overseas team will also join in the battle. The overseas team will be Ceylon Warriors from Dubai. Another highlight of this years’ event will be the participation of several club teams, featuring veteran players from C.R & F.C, C.H. & F.C., Puffins and Havelock’s. Some of the renowned players who will participate are of the caliber of Roger Rodrigo, Kamal Mahendra, Wekadapola, Alex Nishantha, Manoj, Hiran Doranegama, Ajith Weeratunga, Pavithra Fernando, Namal Rajapakse, Cargo Siriwardena, Dharshana Munasinghe, Duminda de Silva, Thushara Bandara, Tuan Bohran, Chula Dharmadasa, Vipula Dharmadasa, Wimal Eparachchi, P.G. Nimalasiri, Mangala de Silva, Harin Fernando, Azarath Deen, and Rohan Chinthaka. laid out in hawker style, to indulge in scrumptious snacks and beverages provided by Prima. The after party will comprise of a well-known local DJ and a band. The party will start from 7.30pm onwards and will bring in a vibrant ambiance for party lovers to let loose and have fun. DJ and the popular Band Audio squad, will entertain the crowd with eclectic house music. Rugby Rumble promises to be an unforgettable experience packed with nothing but cheer and fun, for the whole family to enjoy. The event will be held in association with Yes 101 and Legends 96.6. The main sponsors for the event is Agoal Rugby and Mobitel and co-sponsors are Prima, TVS Lanka, RBN, ICBT, Future World, Speed Water, Web X Pay, Red Bull and Coca Cola.